Fuelwood supply a complete range of Firewood Processors. With the ability to advise which machine is most suitable for you, from the Mobile Japa 305 to the immense Transaw 350XLS. Fuelwood's expertise in Firewood Processors is renowned, whilst using an engineering background to develop Firewood Processors specifically for the demands of customers. Many professional Operators dream of building a machine for themselves. Well Fuelwood have fulfilled this dream. 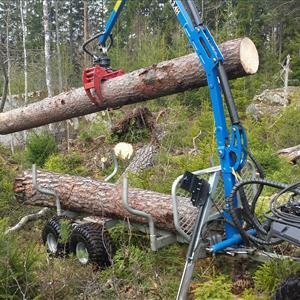 The Transaw 350XLS is a semi-automatic Firewood Processor that offers a perfect solution to the Firewood needs of Customers.